On the evening of July 25, 1944, Lieutenant Kenneth D. Smith was piloting an F6F-5N Hellcat, (Bu. No. 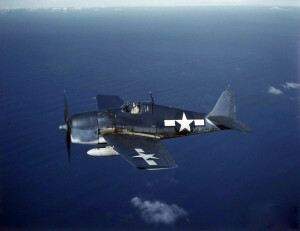 58238), about twenty miles off Block Island participating in a gunnery training flight. Shortly after 8 p.m. he began making his run at a surface target from an altitude of 20,000 feet and pulled out of the dive at 14,500 feet. He then began to climb to back to 20,000 feet when he noticed the cockpit gauges indicating a high oil temperature and low oil pressure. Then the aircraft began loosing power and Lt. Smith was forced to make an emergency water landing. The plane remained afloat long enough for Smith to climb out and swim away. He then inflated his life vest and emergency raft and was rescued less than an hour later by a Coast Guard boat. The aircraft was not recovered.